"Experienced Party & Wedding DJ"
Malibu Disco is one of the best known names in party entertainment in the area. 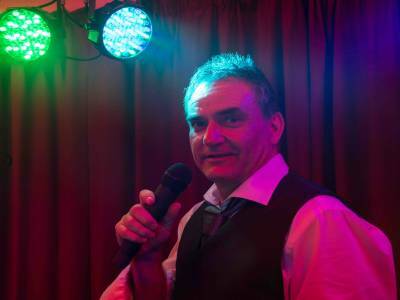 Established by DJ Jef Powell in the early eighties and providing 'The best party in the world - Ever' at a reasonable price in thousands of venues, the show now includes high quality professional grade PA equipment and LED DMX lighting. DJ Jef started behind the decks in the seventies, and now entertains at many quality hotels. He is also an experienced radio presenter and recently began working on his own radio station project. Required by many venues, Malibu Disco has a current PLI policy with Mobile DJ Network in the amount of £10 million. Also required by many venues, Malibu Disco has supplied satisfactory evidence of holding current PAT inspections of their equipment dated within the last 12 months. A Method Statement, outlining Malibu Disco&apos;s Health & Safety procedure for setting up disco equipment has not been supplied. Why do people choose to book Malibu Disco? "Jef was very professional and the disco he provided met our needs perfectly. Would certainly use again and would recommend to everyone. Thank You "
"thank you it was a great night!" "Jeff was brilliant. Would highly recommend him for your function or event. " "Thanks Michelle, it was a pleasure & a worth cause, Jef"
"Jeff was a brilliant Dj. We had a fantastic time and really enjoyed him playing the best of the 50's rockabilly music. We loved the energy and fun. 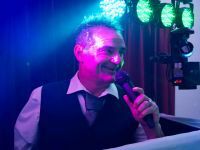 He was a great DJ and did a brilliant job in providing the right music throughout the night following our playlist, taking requests, and allowing us to use the microphone for speeches. He helped make our party a party we will remember for a long time and I would certainly recommend him and book him again if I was having another party :)"
"Thank you so much it was a pleasure"
"I have had brilliant feedback about the night from friends and family"
"Thank you so much - it was a pleasure - Jef"
"Fantastic DJ - great set - everyone loved it! Thank you so much for making my husband;s 30th, especially his MJ entrance! Highly recommended and will definitely use again!" Malibu Disco also offers a range of additional party services not directly linked to musical entertainment. Please note that needadisco.com has no editorial control over these images which are stored on flickr.com. If you have any concerns about what you see below, for example potential copyright infringement or unsuitable content, you should take this up with Malibu Disco directly using the Contact section below, or else you may alert flickr.com directly quoting "set number 72157678087480200". If you are contacting Malibu Disco about an event, it's always a good idea to include the DATE, LOCATION, EVENT TYPE, AGE GROUP and TIMINGS to speed things up!